First five-star difficulty stage across the Alps. 5 over 181-km long categorized climbs with 4400 m cumulative elevation gain. 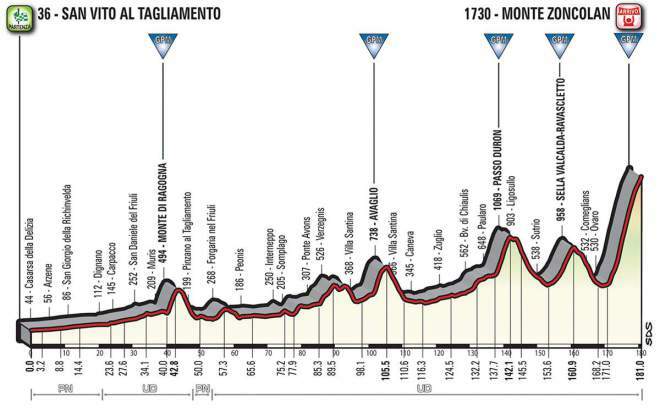 Monte di Ragogna and its steep climbs and, in the final 45 km, Passo Duron, Sella Valcalda and Monte Zoncolan, without a single flat stretch, are the summits in this stage. 6th finish on the Zoncolan, and the 5th one on the “intimidating” side of Ovaro. On Monte di Ragogna several Tours of Friuli finished, amongst all when Gianni Bugno won the Italian championship in 1990. Monte Zoncolan has gradients topping out 22% in its first part. In Chialina (1.5 km before the foot of the climb) there will be the usual pit-stop where the followers’ vehicles will be replaced by motorbikes.